Sometime back a company approached me to do some SEO work for them. I refused because I had too much on my hands at that time including my PhD upgrades. Later I realised that I should have taken up the job as it was good money and as we all know, search engine optimisation is not a overnight job - it's an ongoing process (at least it should be). Anyway, was pleasantly surprised when I found out that my post "SEO Coventry" on my ah ok lah blog is now #4 on Google for the search terms. 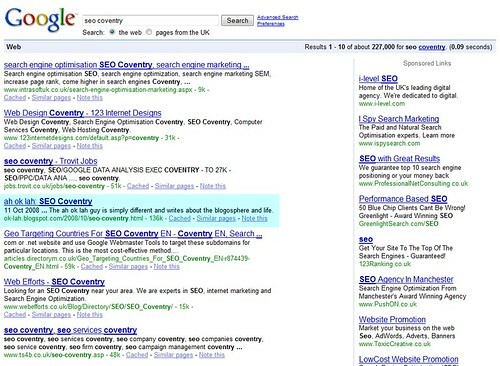 I don't want to brag but I guess I am one of the SEO experts here in Coventry. Feel free to contact me if you need help with Search Engine Optimisation. There will be better or equally good job offer anytime. Have hope!! Do you think it's true that Google favour blogs from wordpress? If I'm not mistaken, you bought your domain name from Godaddy and host it at blogspot, and yet your blog came out fourth rank in the Google search. I have a free wordpress and blogger's blog, but my wordpress has more stranger guests visiting than the other blogspot blogs. How can I buy a domain names or place ads on my blog, if I don't have a credit card? Hi Rani, That's true. I am actually working temporarily as a web developer in the University of Warwick. That's a couple of questions you have here and they gave me an idea for a new post. Thanks for stopping by and leaving a comment on my Thursday blog. You made my day!! Hope your day treats you well. Good SEO work! I guess there's very little competition for that keyphrase, so it was easy for you to rank highly for it. Why would Google favour Wordpress over their own Blogger? I don't think they favor it over Blogger, but typically what I've seen is that they favor blogs more because of the feeds and the ever changing content. I had something similar happen to me, I love it when random keywords achieve high results. I was No.3 For 'Imperial bento' for a while! Prior to a few months ago, Wordpress followed all of its links from within its tag category pages which gave an advantage. Blogs that were hosted on Wordpress got a ton of PR and links back from high PR authority tag pages from Wordress. Recently Wordpress nofollowed all of the links on it's tag pages back to the blogs that were being tagged in that category. Therefore, the extra link love they got is gone. It would not surprise me that many of those blogs lose their listings and tons of traffic.